Jupiter's south pole is on display in an image created by a citizen scientist using data from NASA's Juno spacecraft. The JunoCam instrument aboard the spacecraft snaps images of the Jovian giant each time Juno makes a close flyby, every 53 days. Those images are uploaded to the JunoCam website and are available for members of the public to process. 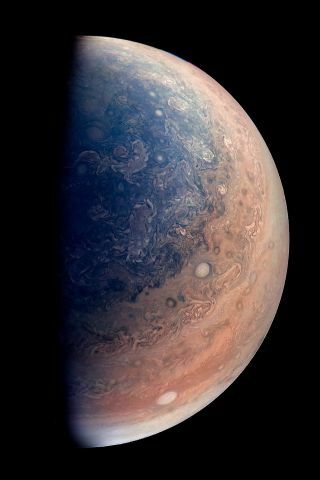 JunoCam collected the raw image on Dec. 11, 2016, at 9:44 a.m. PST (12:44 p.m. EST), from an altitude of about 32,400 miles (52,200 kilometers) above the planet's cloud tops. Juno's path around the planet takes the probe over Jupiter's poles, which were not photographed previously or not observed in detail. The weather patterns at the poles are "unlike anything previously seen on any of our solar system's gas-giant planets," NASA said in a statement released last September. The JunoCam project not only lets citizen scientists process Juno's raw data and create amazing images, but also welcomes citizens to vote on which features JunoCam should photograph during each flyby. The last flyby took place on March 27, and the next one will take place on May 19. To participate in the vote, go to the JunoCam website and click on the Voting tab. The website also features the JunoCam raw images and the images processed by citizen scientists.